In many ways, Ronald Koeman has had a rather varied start to his Everton career. His opening 8 months have contained moments of magic, madness and mayhem, with the 4-0 win over Manchester City, the 5-0 thumping at Chelsea and the 6-3 barnstormer against Bournemouth being perfect examples of each. What has felt missing, at times, has been that all-important consistency. This is by no means a new problem for Everton. In recent years they have regularly pulled off big wins over the Premier League’s elite, only to fail to capitalise against the so-called minnows of the division. Eleventh place finishes in the last two seasons are testament to this problem. Look a little deeper, however, and you will find that Koeman’s plan to reinvigorate the club may actually already be paying dividends, as the club begins to benefits from hiring a manager with extensive Premier League knowledge. In every Premier League season since 2002/03, the side with the best home record has gone on to win the league. It is a genuine marker for success, and Ronald Koeman is well aware of this. Since arriving at the club he has set about making Goodison Park a fortress once more, and it’s working. So far this season, Everton have won 7, drawn 4 and lost just 1 of their 12 Premier League home games, taking 25 points in the process. It’s the 5th best record in the division (only Chelsea, Tottenham, Arsenal and Burnley have bettered it) and more importantly, it marks a significant improvement on past Toffees performances. In their last 10 Premier League campaigns, Everton have only matched their current points haul after 12 home games once. That was in the 2013/14 season when they finished 5th, above the likes of Tottenham and Manchester United, and even the 2004/05 side that famously gatecrashed ‘The Big 4’ to gain Champions League qualification could not better this season’s record. It may seem obvious to say, but this upturn in fortunes is down to two very simple factors – tightening up at the back and being more ruthless up front. Currently, 22.9% of shots taken by Everton at Goodison Park are hitting the back of the net. 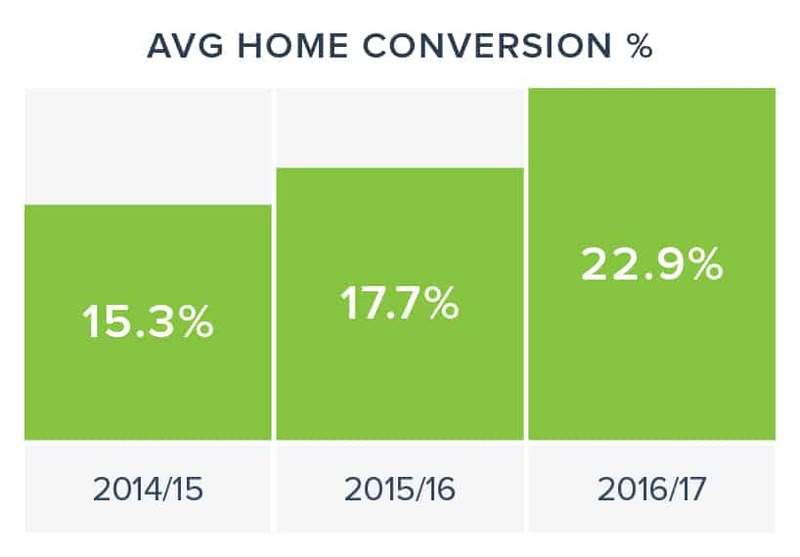 It’s a level of clinical finishing that few in the Premier League can match, and it’s a massive improvement on records in the last 2 seasons of 17.7% and 15.3%. At the back, things are also looking much more secure during home games. 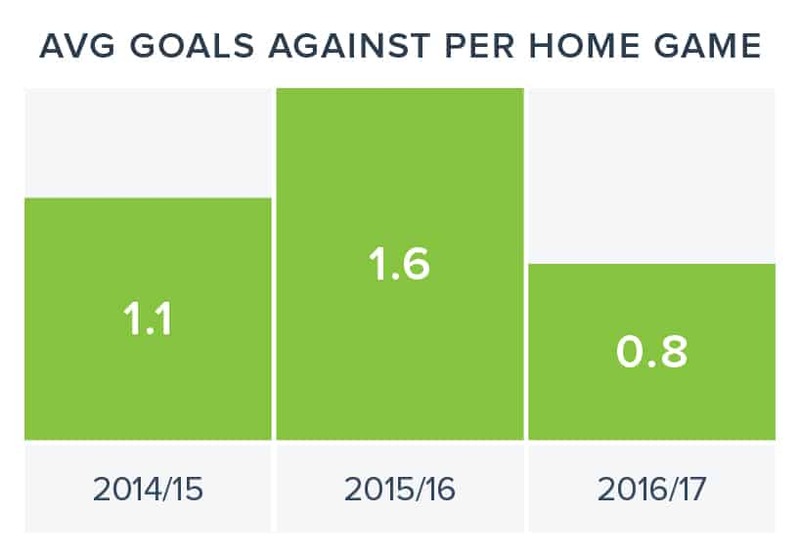 In 2014/15 Everton were conceding on average 1.1 goals per game, and in 2015/16 that went up to 1.6. 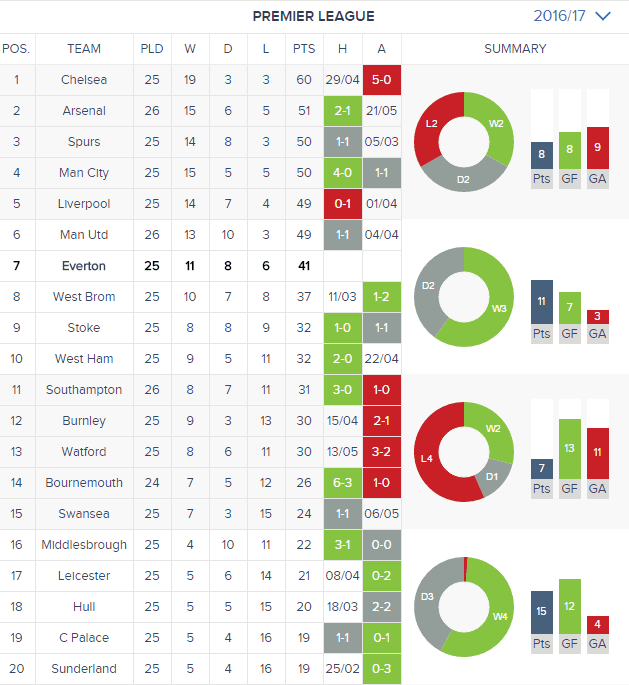 This season, however, they’re conceding just 0.8 goals per game, and have kept 4 clean sheets in the process. Overall, things are looking bright at Goodison Park for Everton. Koeman has his team delivering at both ends of the field, and the rewards are beginning to arrive. Everton away is once again a fixture teams fear, and that can only lead to success in the years to come.